Following the Civil War, many settlers came to Kansas in hopes of finding inexpensive land and a better life. By 1874 many of these newly-arrived families had broken the prairie and planted their crops. During the spring and early summer months of that year the state experienced sufficient rains. Eagerly the farmers looked forward to the harvest. However, during the heat of summer a drought occurred. Yet this was not the most devastating thing to happen to the farmers that summer. The invasion began in late July when without warning millions of grasshoppers, or Rocky Mountain locusts, descended on the prairies from the Dakotas to Texas. The insects arrived in swarms so large they blocked out the sun and sounded like a rainstorm. They ate crops out of the ground, as well as the wool from live sheep and clothing off people's backs. Paper, tree bark, and even wooden tool handles were devoured. Hoppers were reported to have been several inches deep on the ground and locomotives could not get traction because the insects made the rails too slippery. As a whole, Kansans refused to be defeated. 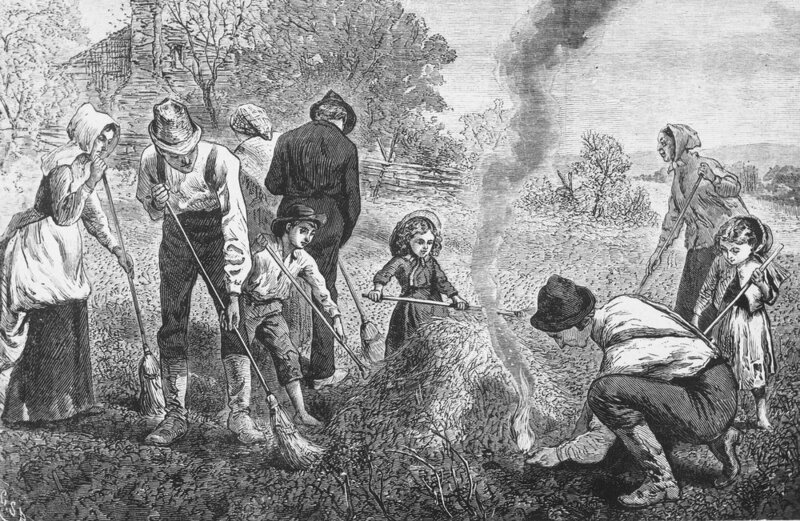 The settlers did their best to stop the hoppers by raking them into piles, like leaves, and burning them but these efforts were in vain because of the sheer numbers of the pests. Inventive citizens built hopper dozers or grasshopper harvesters to combat future visitations. The hoppers usually stayed from two days to a week and then left as they had come, on the wind. The areas hit the worst were where most of the settlers were new arrivals, not having had the time to establish themselves in their new homes. The needs of the newly-arrived immigrants in the western counties of Kansas were greater than the more settled eastern portion. They needed grain for their next year’s crops and to feed their work animals. They also needed provisions and clothing to make it through the coming winter. 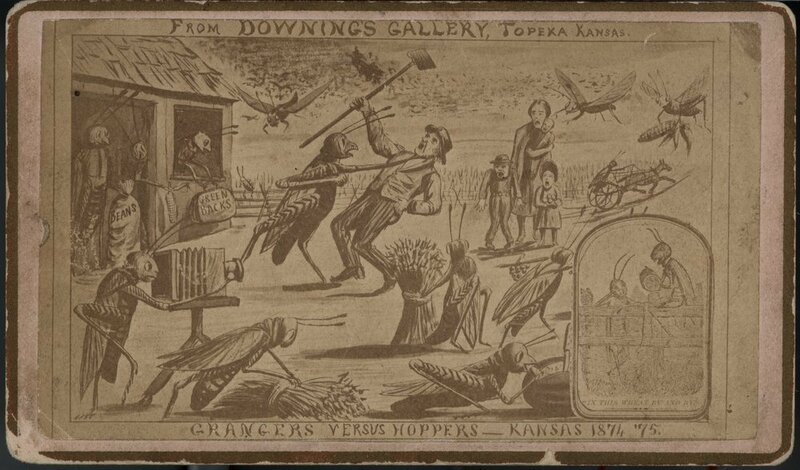 Governor Thomas Osborn called a special session of the legislature, which convened on September 15, 1874, hoping to find a way to help Kansans survive the calamity and relieve the destitution left by the grasshoppers. The legislature determined that it did not have the power to take money directly from the state’s treasury to help with the emergency. It did approve $73,000 in bonds to provide aid. The plea for help went across America. The rest of the nation responded to pleas for aid by sending money and supplies, which were often hauled free of charge by the railroads. Soon aid for the destitute Kansans began to arrive. Railroads provided free transportation of the barrels, boxes, and bales of supplies such as beans, pork, and rice. America’s farmers even donated rail cars full of barley and corn to assist Kansans with the next year’s planting.